‘Hearty, authentic curry made from scratch’ and ‘Effortless & quick curry to prepare’. Sounds appealing? The challenge is finding a recipe that features both of these sentences. That’s because, as anyone who’s cooked a curry from scratch knows, there’s usually a labour of love involved. Provided, like me, you shun short cuts like store bought curry paste then a good curry often involves heaps of ingredients and a reasonable amount of time. 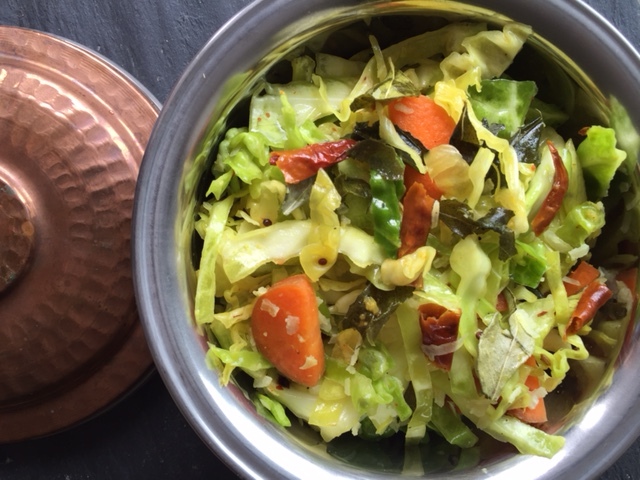 So, when I looked online for a traditional Indian curry with cabbage, I was surprised to find a recipe with a short preparation time and an even shorter cooking time. 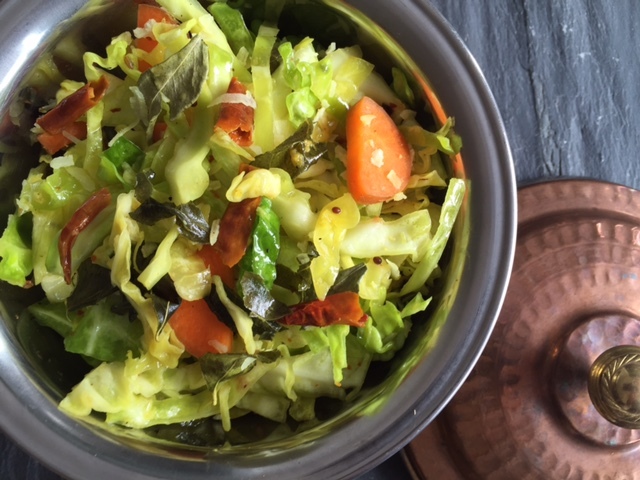 I was also surprised that my top pick recipe from everything the Internet had to offer, called cabbage thoran, was sat waiting for me on my own bookcase – in Rick Stein’s India cookbook. This reminded me to first source inspiration from my own cookbook collection, rather than from going straight to Google. The delicious cabbage thoran you see here ticks all the boxes of being vegetarian, vegan, gluten free and paleo friendly. It also really is super fast to prepare. After finding the recipe I quickly got to work grating ginger, toasting and popping spices, slicing carrots and finely shredding a whole cabbage. From start to finish in under 20 minutes this dish was ready to feast upon. The recipe I followed is Rick Stein’s take on thoran – a dry vegetable curry that comes from Kerala in the south of India. It’s like a vegetable stir fry that’s packed with goodness from, amongst other things, mustard seeds, turmeric and curry leaves. I’m not detailing the recipe here – but rather here’s a link to it on the BBC food website. I assume it’s there because the BBC airs the TV show that accompanies Rick Stein’s book. Anyway if you’re after a quick weeknight curry grab a cabbage and give this a go and serve it with natural yoghurt, bread and rice. And of course happy Fiesta Friday – go check out some of the lovely recipes at this week’s Fiesta Friday #139 party. Your co-hosts this week are Antonia from Zoale and Sandhya from Indfused. Tags: cabbage, Kerala, recipe, thoran, vegan, vegetarian. Bookmark the permalink. Elaine – good to hear you discovered thoran before me – I’m not a fan of eg Chinese stir fries and much prefer anything Indian-esque…..and yes look up Rick Stein’s version – it’s easily adaptable too to mixing up the veggies! I’m not keen on stir fries either! I view this dish differently for some reason!! Thanks Angie – I love the idea of including brussel sprouts – that would be interesting combined with the coconut flavour….. I am a huge cabbage fan, and this looks delicious! Thank you for sharing this yummy dish with us at Fiesta Friday! 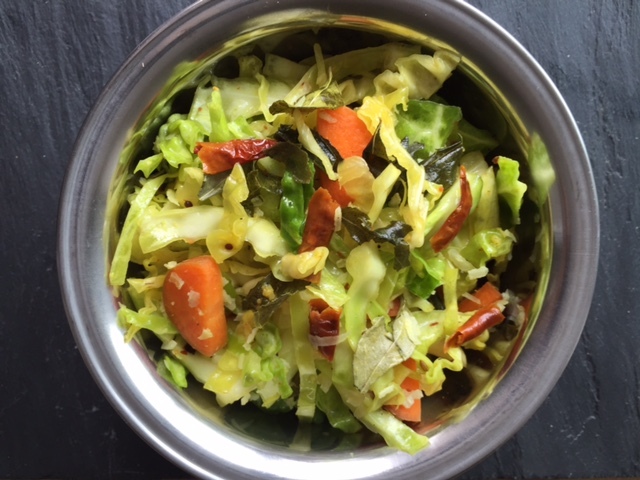 Thanks Antonia – glad you like it – such an easy way to spice up ordinary cabbage! Hi Laura, this looks awesome. Amazing combination of cabbage and coconut!! So colorful and appetizing dish, Laura! I am so happy I stumbled upon this healthy recipe! Thanks – yes it’s one of my top Indian veggie dishes – he coconut makes all the difference….